3 of these Mustang GT Enduro hatchbacks were built by Ford Motorsports to travel the country and promote Ford racing. 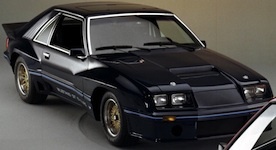 One dark blue and two red were built based off the 1979-82 IMSA Mustang racer and many of the 1980 SVO M81 McLaren Mustang body features were used. Cool Ford promotional photo of a Black 1983 Mustang GT Enduro with sunroof, hood pins, blue molding insert, gold lace-type wheels, hood vent, rear spoiler/wing, and "Mustang GT Enduro" on the side. Three of these performance GT's where built by Ford to promote its racing products and design. Two were red, one dark blue. The body was patterned off the 1980 SVO M81 McLaren. Wilson Swilley owns this ultra rare 1982 Mustang GT Enduro. This is our featured Attitude Of The Week for the week starting August 19, 2012. Only three of these were made; one blue and two in red. Wilson is an expert on these cars. Here is research on the car. They were used by Firestone as promotional car for their HPR tires during the 1982 IMSA race season.